This topic contains 1 reply, has 2 voices, and was last updated by Keith Taylor 7 months, 3 weeks ago. 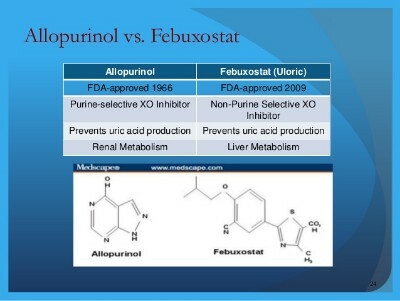 I am on Allopurinol currently, but just wondering which one works better for getting Uric acid down quickly Allopurinol or Febuxostat? Which one has lesser side effects as compared to the other? Do you choose Allopurinol or Uloric? – reaction to starting dose. For certain ethnic groups, rheumatologists recommend a screening test for the presence of a specific genetic variant. So consider allopurinol screening for Korean, Han Chinese, and Thai racial groups, and discuss with your doctor. In all cases, allopurinol starting dose should be no higher than 100 mg per day. Then your doctor should test your blood after 2 to 4 weeks. Tests should include kidney function and liver function as well as uric acid. Because that allows your doctor to see if allopurinol is causing any unwanted blood abnormalities. Also, your doctor should ask about any other side-effects you might have. If all is OK, your doctor will increase the allopurinol dose gradually until you reach your target uric acid level for dissolving old uric acid crystals (debulking). Of course, each dose increase must be accompanied by the same 3 blood tests. If blood test results or other symptoms indicate a problem with allopurinol, your doctor should consider switching to febuxostat (Uloric). In which case, the starting dose should be 20 mg per day. Then slowly increase as with allopurinol. If febuxostat also presents problems, you are in a tiny minority of cases that are harder to manage. But not impossible. Because uricosurics might provide a solution. Otherwise very low-dose allopurinol with tiny incremental increases has been shown to overcome adverse reactions. But I’m not aware of any similar cases of slow introduction of febuxostat.